Produktinformationen "18s 15NW530 8 Ohm"
The 15NW530 low frequency neodymium transducer has been specifically developed for high power, low distortion, compact subwoofer applications. The transducer finds its main application on compact vented subwoofers as small as 75 lit. properly tuned, but it is suitable also in bandpass or horn loaded applications. The neodymium magnet assembly assures high flux concentration, low power compression and excellent heat exchange, since the external magnet configuration is considerably more efficient than traditional under-pole magnet topology. This results in high levels of force factor and power handling with an optimum power to weight ratio. The transducer incorporates Eighteen Sound exclusive DSS technology (Double Silicon Spider) in combination with a single roll highly damped rubber surround. The already low distortion and sound quality are further improved by properly positioned Single Demodulating Ring (SDR technology) that flatten impedance and phase with a constant power transfer. 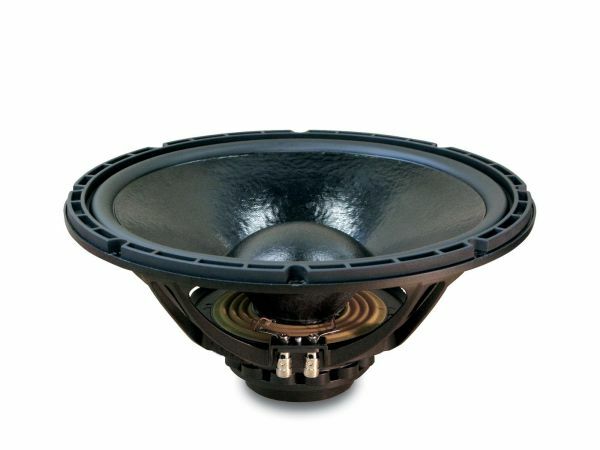 The 75mm edge-wound state-of-the-art voice coil assembly is wound on a strong fiberglas former to improve force transmission and power handling. The deep profile curvilinear cone, created from a special high strength wood pulp, has been designed to achieve the best possible linearity within its frequency range. The in-house developed cone treatment is a humidity repellent and significantly dampens bell mode resonances. A special coating applied to both the top and back plates makes the 15NW530 far more resistant to the corrosive effects of salts and oxidization. Weiterführende Links zu "18s 15NW530 8 Ohm"
Kundenbewertungen für "18s 15NW530 8 Ohm"